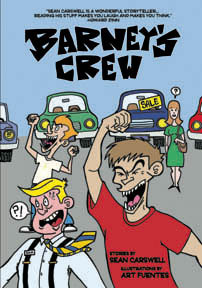 Barney’s Crew is my third book. It’s a collection of stories I wrote between 2003 and 2004. It includes four previously published stories (“Barney’s Crew” ran in Razorcake, “The Last Days of Fulton County Stadium” ran in Zisk, “Tommy Smedley’s Nose” ran in Sleepwalk and was reprinted online at Word Riot, and “Pucker Up Little Camper” ran in READ). Sean Carswell is an eyewitness correspondent of the marginally employed, a street-level philosopher of the underclass majority. Barney’s Crew is a short story collection about a world full of disgruntled construction workers, fiercely independent waitresses, sun-stained deep thinkers, artists at a hog dog rodeo, and kids caught in the crossfire of this cruel world. Amid the swirling eddies, Carswell manages to find the positive moments, and he’s always perceptive enough to hear the muted tones of hope. You can order it from Gorsky Press here. You can order it from Razorcake here. It’s also available from most online sellers.